Preheat an oven to 400 degrees. 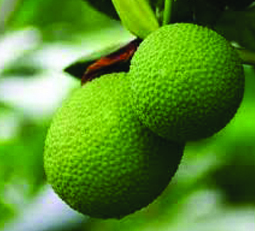 Cut the top of the breadfruit off and score the bottom with an “x”. Roast on a sheet pan for about 35-45 minutes or until you can insert a knife easily into the centre. Once cooked remove from the oven and allow to cool. Peel the skin by cutting with a knife. Dice the breadfruit into 1 inch cubes. Combine the aioli, green onion, peppers, scotch bonnet, vinegar, sour cream, salt and pepper in a mixing bowl and whisk until combined. Stir in the breadfruit. Season to taste. Meanwhile, pour about 1 cup of kosher salt into a baking dish and place the beet on the salt. Roast in the oven at 350 degrees until cooked though. Allow to cool and peel. Slice thinly and reserve for plating.